You'll hardly realize you have our Ultra-Slim Manual Inflatable life jacket on...but it's there when you need it! 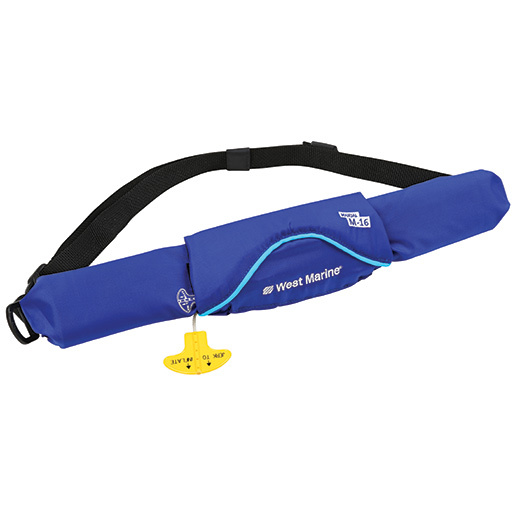 West Marine's Ultra-Slim Manual Inflatable Life Jacket Belt Pack offers a low-profile, slim design that provides maximum comfort and maneuverability while paddling, fishing or other recreational boating. This life jacket features easy manual, pull-cord inflation and an oral inflation backup tube. It provides 19 pounds of buoyancy with its initial 16g CO2 charge, yet the wearer can provide additional buoyancy of up to a total of 26.5 pounds by using the oral inflation tube. Easily repacked and maintained thanks to its compact and lightweight design. This life vest must be manually placed around the head after inflation and is therefore recommended for competent swimmers only. Size: Universal size for persons 16 years of age and older who weigh more than 80lb. For more information on USCG approval types and why you should always wear your life jacket when you are on a boat, see “Think Safe Choose the Right Personal Flotation Device (PFD)”. Which life jacket for each style of boating?